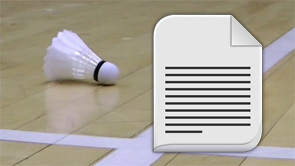 The Badminton Bible teaches players how to improve their badminton. Whether you’re a beginner or expert, you’ll find something useful here. We combine coaching videos with written explanations. Most videos require a subscription, but all the text is free. While the text is pretty useful, you’ll definitely get a lot more from watching the videos too. How to hit different shots, as well as core skills like grips (how to hold the racket). Covering the court efficiently to give yourself much better shot options. Court positioning and shot selection. Understand the guidelines, then adapt them for your opponents. Simple rules for beginners, plus all the gritty details for resolving disputes at club nights!